Experience Akaroa on a budget! 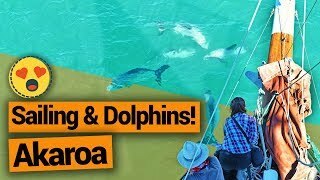 It’s true, Akaroa is small town packed with activities: dolphin swimming, sailing cruises, wildlife tours and more! 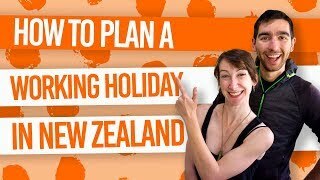 However, when you’re staying a while in the “French Capital”, or you’re travelling on a low budget, you’re going to want to find some free and cheap things to do in Akaroa. We can help you there with this list of free things to do in Akaroa! (And some cheap stuff too). The best way to save money in Akaroa is to do a few hikes. Luckily, the town and surrounding Banks Peninsula are full of them. We’ve listed the highlights in the list below. We’ve also included some extra free and cheap activities in Akaroa giving you variety in things to do. For more Akaroa inspiration, see 10 Things We Love About Akaroa, as well as our complete guide to Akaroa. A great vantage point of Akaroa (that’s also easy to get to) is from the Akaroa Lighthouse. This lighthouse is unusually situated inside the harbour after lighthouse enthusiasts saved the structure from being demolished when it was no longer in use. The Akaroa Lighthouse is a fantastic picture opportunity itself, while being situated at a great viewpoint. The lighthouse is easy to spot from the town centre so simply walk toward it! Otherwise known as the Children’s Bay Walkway, this walk and free thing to do in Akaroa is accessible from Akaroa town itself. Take the boardwalk at the north end of town to Children’s Bay where the Children’s Bay Walkway begins. Walk alongside farmland and forest to a spectacular viewpoint overlooking the Akaroa Harbour. Look out for animal sculptures along the way! The walk is either a 3-hour loop, or another good option is to walk to The Rhino, taking about an hour, and return the same way. Location: Start from Children’s Bay or the boardwalk to Children’s Bay from the north side of Akaroa town waterfront. For those of you who love the great outdoors, look no further than the Hinewai Reserve! The reserve holds around 12km of walking tracks, with the main feature being Stony Bay Peak. Sitting 800m high above the Banks Peninsula, it’s a great place to soak in the scenery. Check out the details of this walk and others in Akaroa with our Akaroa – Guide for Backpackers. Location: 8km inland from Akaroa along Long Bay Road. Of course, hiking is the free option for things to do in Akaroa, and another fantastic hike is the Misty Peaks hike. This 3-hour return track takes you along the ridgeline overlooking Akaroa and other bays in the Banks Peninsula. 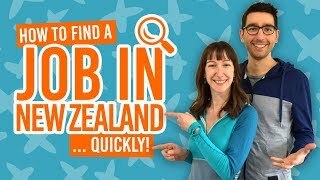 Hiring a bike for this mountain bike trail can be hired for as little as NZ$35 for four hours from the adventure centre on the waterfront of Akaroa. Step into this garden that looks like something out of a fairy tale. The Giants House is a creation of a local artist where the garden is decorated with mosaic art, water features and more. There’s a cafe on-site and an art gallery. At NZ$20 per person, it’s definitely one of the more affordable things to do in Akaroa. Akaroa has a huge French influence, which means great food! French bakeries, creperies, cafes and more can be experienced in Akaroa. Additionally, the fish and chips is also a must! Depending on what you order, trying the tastes of Akaroa can be a pretty cheap experience. (But once you’ve tried the baguettes at the French bakery, it’s easy to let things spiral out of control. Trust us!) For inspiration of what New Zealand food to look out for, see 11 Foods You Have to Try in New Zealand. On the subject of food, don’t miss Barry Bays Cheese. They offer cheese tastings every day in their store and factory. Barrys Bay Cheese is a 12km drive from Akaroa along the main highway between Akaroa and Christchurch. 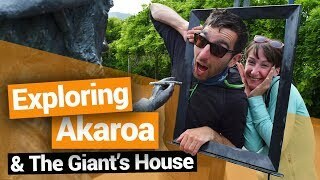 It’s one of the many free things to do in Akaroa! For a dose of Maori culture, visit the small settlement of Onuku, just 6km south of Akaroa. Either walk, bike or drive through the forested road to Onuku where the settlement boats a large carved marae “meeting house” and small Maori church. The church is accessible to the public and well worth checking out. 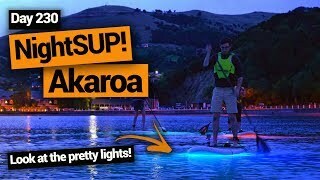 Exploring the Akaroa Harbour by kayak or stand up paddleboard is an affordable experience with one-hour hire being around NZ$20. Check out the coastline of the local harbour and you never know, you might even meet a dolphin or two! And last on our free things to do in Akaroa… Who doesn’t like a good waterfall? 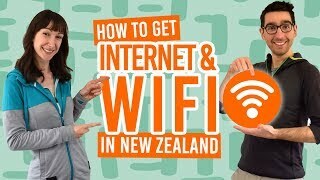 Better yet, a free thing to do in Akaroa?! The Newton’s Waterfall is in the Misty Peaks Reserve down a 10-minute walking track. Nestled in native bush, the Newton’s Waterfall makes a pretty picture opportunity. Location: Down the Aylmers Valley Road. Park in the Misty Peaks Reserve car park. Alternatively, walk from Akaroa (30-45 minutes one way). 11. Grab a cheap activity deal from our Deals page! That’s right, we often have some amazing deals on activities in Akaroa for under NZ$20! Take a look at our exclusive Akaroa deals over on the BackpackerGuide.NZ DEALS tab.